The error on the “last ever” speaker of Livonian does appears to be corrected in the first sentence of The Times article itself. Yet this same sentence introduces two other major mistakes, on which the remainder of this post will focus. This sentence reads: “The last native speaker of the ancient Baltic language of Livonian has died aged 103”—but calling Livonian (or any other language, for that matter) “ancient” is meaningless, while calling it a “Baltic language” is simply erroneous. Let’s begin with the second issue. In linguistics, “Baltic language” refers to members of a particular language family, that is a grouping of languages descended from a common ancestral tongue. The Baltic family—which is often regarded as forming a branch of the broader Balto-Slavic family within the even larger Indo-European language family—includes two living languages—Latvian and Lithuanian—and one extinct language: Old Prussian. Note that another national language of a Baltic state, Estonian, is not a Baltic language. 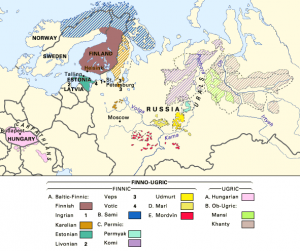 Instead, Estonian belongs to the Finnic subgrouping within the larger Finno-Ugric language family, which in turns nests within the Uralic family. Finnic languages include Finnish, Karelian, Veps, and other related languages (see the map by Riho Grünthal & Anneli Sarhimaa on the left). Livonian is the member of the same language family; it is marked by the orange-red spot at the very bottom of the map. Older maps of the Finno-Ugric languages (such as the Encyclopedia Britannica map or the Wikipedia map, both reproduced on the left) often show Livonian as spoken across much of the coastal area of Latvia, whereas more recent maps of the family often do not show Livonian at all, as it is either too localized to be shown on maps of that scale (hence some of the maps, like the first one reproduced on the left, show it with a number rather than a colored area) or because it has long been nearly extinct. The fact that Ms. Kristina, the last native speaker, lived in Canada does not help with mapping the language either. 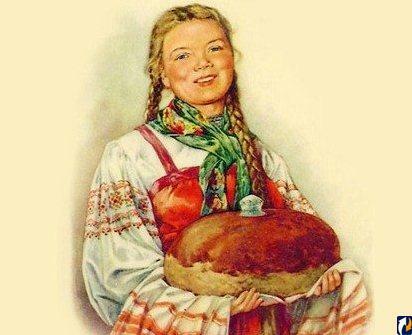 Because of its location, all aspects of Livonian, including its vocabulary, sound system, and grammar, have been influenced for centuries by Latvian, and to a lesser degree, and more indirectly, by German. Roughly 2,000 Latvian and 200 German loanwords are found in Livonian; most of the German words were incorporated through Latvian. The dative case in Livonian is also a reflex of Latvian influence. But Latvian has also been influenced by Livonian. For example, the fixed initial stress in Latvian is rather unusual for a Balto-Slavic language but is commonplace in Finnic languages, including Livonian. Latvian’s closest relative, Lithuanian, for example, has no fixed stress: stress can fall anywhere in Lithuanian words. Since the end of the 19th century, Livonian has also been in contact with Estonian, as many inhabitants of Saaremaa and other islands of Western Estonia worked during summers in the villages of the Kurzeme Livonians. The influence of Estonian on Livonian is mostly lexical, contributing about 800 Estonian loanwords, most of them from the Saaremaa dialect. However, once those layers of linguistic influence through contact are peeled away, Livonian exhibits all the hallmarks of a Finnic language. 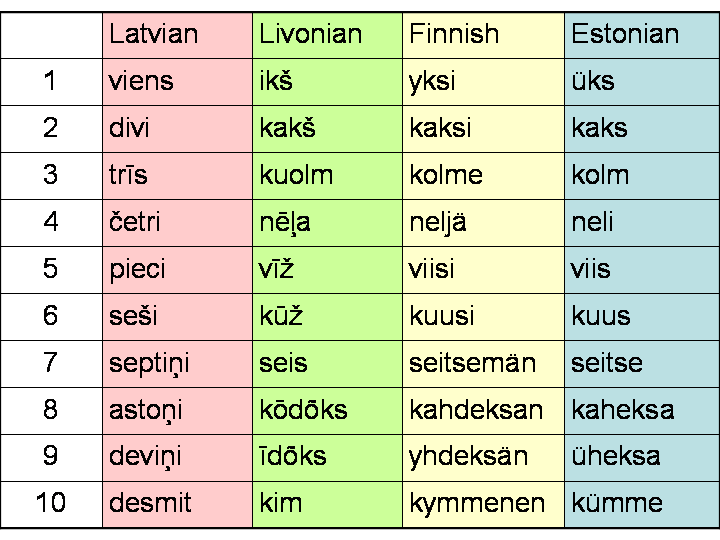 For example, like Finnish and Estonian, Livonian has locative grammatical cases, such as inessive, illative, and elative (meaning ‘in’, ‘into’, and ‘out of’). The actual case suffixes, such as the -s for inessive and -st for elative, are cognate between the three languages. 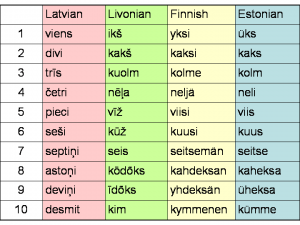 A comparison of basic vocabulary, for instance numerals, across the three languages also confirms their relatedness (see chart on the left); Latvian numerals, in contrast, are quite different from those in Finnic languages and much more like those in other Indo-European languages. Livonian is thus in no way a Baltic language. Yet the situation is further complicated by the existence of a Livonian dialect (or a group of closely related dialects) of the Latvian language, shown in blue on the Wikipedia map reproduced on the left. The other two dialects of Latvian—the Middle dialect, which is the basis of standard Latvian, and the Upper, or Latgalian, dialect—are shown in green and yellow, respectively. The Livonian dialect of Latvian is divided into the Vidzeme and the Courland varieties. As can be expected, the Livonian dialect of Latvian was more affected by the Livonian language substratum than other forms of Latvian. This dialect resulted from the introduction of grammatical structures from the language by assimilated Livonians who switched to speaking Latvian. But due to migration and the introduction of a standardized language, the Livonian dialect of Latvian has declined substantially in recent decades. Thus while the Livonian dialect of Latvian is a Baltic language, Livonian proper is not. But is it an “ancient language” in any meaningful sense? As my earlier post in Languages of the World blog on the question of “the oldest language” has generated a heated discussion (second only to the question of what language is the most difficult to learn), it is worth reviewing this issue here. What does it mean to say that a given language is “ancient” or “old”? There is one sensible way to use the expression “an ancient language”: to apply it to languages that were spoken in antiquity and which have long been extinct. In this sense, the term “ancient language” applies to Scythian, Tocharian, and Sumerian, to give just a few examples. We can also speak of Ancient Greek, as distinct from Modern Greek, with which it is not mutually comprehensible. Likewise, “old” may be applied to languages from the past that are no longer spoken today, whether or not they have left modern descendants, as in the case of Old English or Old Prussian, respectively. However, the author of The Times article on the demise of Livonian, David Charter, clearly does not use the expression “ancient language” in this sense. Instead, he uses it in a way that it is commonly, yet erroneously, used in the popular media or by laymen. For example, Khoisan languages are often described as “the oldest languages in the world”; similar claims were made by several commentators on the Languages of the World blog about Tamil, Albanian, and Russian. 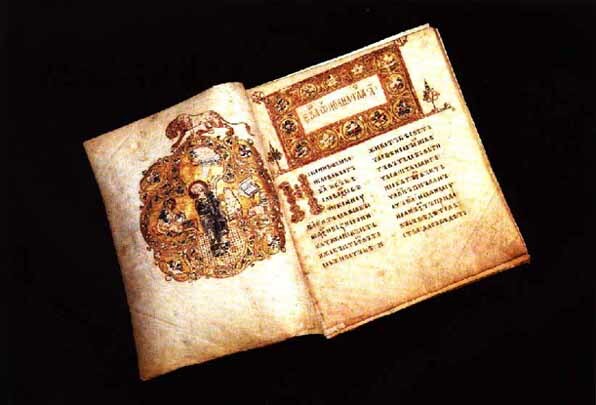 More recently, another misinformed reader of my post on the geography of the words for ‘book’ tried to derive the Arabic and Sanskrit forms (kitāb and pustikā, respectively) from Serbian, which he claimed to be “the oldest language”! Note that such claims of being “an ancient language” have nothing to do with whether a given language was spoken in antiquity (Serbian and Russian were not) or whether it is still spoken today (all of the abovementioned languages are extant). Instead, such claims are typically made to add certain exoticness or mystique to the language (as in the case of Khoisan languages, which have rare click sounds), or to support claims of national grandeur (as in the case of Tamil, Albanian, Russian). Having an ancient writing system is often taken as a sign of linguistic antiquity due to common confusion between language and writing. This is likely the reason behind claims of Tamil’s antiquity, as modern written Tamil has a lot more in common with Old Tamil than does modern spoken Tamil, so much so that it causes a major problem in Tamil Nadu today, as learning the written Tamil language is a bit like learning a foreign language. However, I suspect that Mr. Charter’s use of “ancient” in that unfortunate sentence falls in the first category: it makes the Livonian language sound more mysterious and it adds significance to its extinction (although it may have been partly inspired by Ms. Kristina’s advanced age). 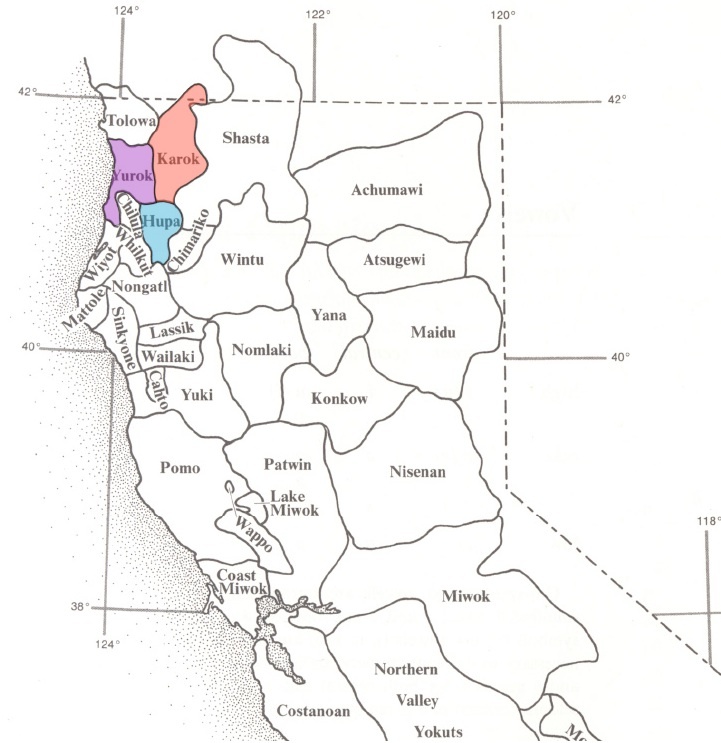 It is also possible that Mr. Charter’s use of “ancient” in reference to Livonian reflects the fact that people speaking a tongue ancestral to modern Livonian are believed to have inhabited this area before the arrival of peoples speaking some Indo-European (Baltic, to be more precise) languages. However, in this sense “indigenous” or “native to the area” is a more appropriate term than “ancient”. Native American languages are hardly more ancient than English or Spanish, which arrived to the New World at a later date. Nor was Livonian a less “ancient” language in Canada as compared to English, French, or Cree. The reason some people think that this or that tongue is the world’s “oldest” or “more ancient” has to do with the way we label languages. Each language is continuously changing, sometimes faster and sometimes slower, but no language ever stands still. * Just as every person has parents, each language (with the exception of constructed and pidgin languages) derives from some ancestral tongue. Barring wholesale language shift, new generation speaks the language of their parents—but with a few changes. These may involve unnoticeable modifications in how words are pronounced, what they mean, or how they are put together. ** But these little transformations accumulate over decades, centuries, and millennia, making the language of long-ago ancestors incomprehensible and unrecognizable to later generations. How fast this process happens varies from language to language and from time to time, yet no language remains the same over long periods of time. Claims that today’s speakers of Tamil, Hebrew, or some other tongue can understand the language as it was spoken 2,000-3,000 years ago are false. Comparing Biblical Hebrew and Modern Hebrew, for example, we find that: meanings of many individual words are different and many new words have replaced older ones; word order is different (e.g. Modern Hebrew is no longer a Verb-Subject-Object language); and the sound system has changed as well (e.g. the so-called “beged-kefet rule” no longer applies in the same way as it did 2,000 years ago). In theory, just as we can trace any person’s DNA to the “Y-chromosomal Adam” or the “mitochondrial Eve”, we could be able to trace each language all the way back to Proto-Human, the common ancestral language of all known human languages. In practice, however, we can only go back a few millennia (how far back a language can be reconstructed is a hotly debated issue, which we will leave aside for now). 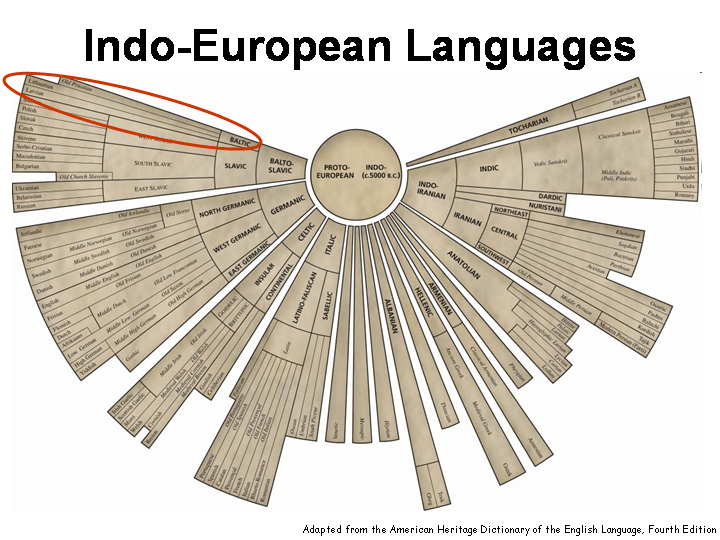 For example, English can be traced back to the Proto-West-Germanic, Proto-Germanic, and Proto-Indo-European tongues. Similarly, Livonian can be traced back to Proto-Finnic, Proto-Finno-Ugric, and Proto-Uralic. The same is true for every language: it can be traced back to its distant ancestors, and in principle all the way back to Proto-Human. Therefore, all currently spoken languages are equally old. The difference is merely in the labels. The impression that a language is “old” or “ancient” usually arises if the language has had the same label for a long period of time. For example, the name of the Farsi (or Persian) language, an Indo-Iranian language of Iran, has been in use since the 6th century BCE, and this fact gives us the impression that Farsi is an ancient language. The same logic applies to Hebrew, Tamil, Livonian, and even English. He cwðæ, Soðlice sum man hæfde twegen suna. Þa cwðæ se gingre to his fæder, Fæder, syle me minne dæl minre æthe þe me to gebyreð. And he seide, A man hadde twei sones; and the Zonger of hem seide to the fadir, Fadir, Zyue me the porcioun of catel, that fallith to me. So what determines whether the label applied to the ever-changing language is the same or different? It appears that the label is changed typically when the language splits into two or more distinct languages. Thus, the label “English” is applied to the language since 450 CE or so because it has not split into multiple mutually incomprehensible varieties: American and British English, for example, are still mutually comprehensible to a large degree. Arguably Scots, however, is a distinct language which has split off ca. 1400, during the Middle English period. The correlation between language diversification and label change also breaks down in the case of Dutch: Afrikaans grew out of Dutch dialects in the 1700, during the early Modern Dutch period, yet the label has not been changed. Likewise, the label “Old Russian” is often used for the ancestral tongue of not only Modern Russian, but Belarusian and Ukrainian as well. 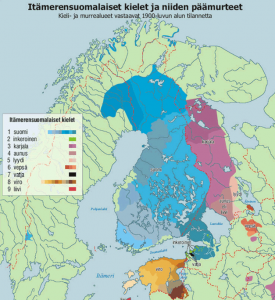 The upshot of this discussion is that no language—Livonian included—is “older” or more “ancient” than any other. Instead of calling Livonian “an ancient language” it would be more appropriate to refer to it as a language that “has had the same label for a long time most likely because we did not care to examine more closely how it has changed over time”, but this wording does not add quite the same mystique, does it? * The rate of grammatical/structural change appears to vary from language to language. For example, Lithuanian is often claimed to be “the most archaic among live Indo-European languages” (Zinkevičius, Z., 1993. Rytų Lietuva praeityje ir dabar. Vilnius: Mokslo ir enciklopedijų leidykla. p. 9). The French linguist Antoine Meillet allegedly said that “anyone wishing to hear how Indo-Europeans spoke should come and listen to a Lithuanian peasant”. Indeed, the phonology and nominal morphology of Lithuanian are very conservative; yet its verbal morphology is much less so, as Lithuanian lacks such archaic features as the synthetic aorist and mediopassive forms. Thus, even in the sense of “little changed”, the use of term “ancient” is meaningless when applied to the language as a whole. ** Even in cases of language shift, the switch is not instantaneous: it takes several generations for the new language to become the language of the land. So again, the language of the great-grandchildren is not the same as that of the great-grandparents, but contemporary generations speak in ways that differ little.